With LIFEPAC 12th Grade Bible, student's will learn how they can make a unique difference for Christ. Preparing young adults for the world, this course covers: Knowing Yourself, Choosing a Ministry, The Trinity, Comparative Religions, and Wisdom. Filled with self-analysis tests, this course is perfect for learning about personality traits, understanding individual's roles, and living a Christian life in today's world. Scripture memorization, diverse question sections, and tests are integrated throughout the worktexts filled with colorful illustrations and engaging lessons. 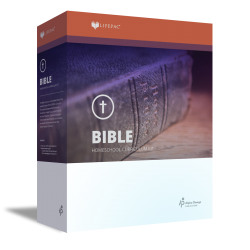 The LIFEPAC 12th Grade Bible Set contains ten worktexts and a teacher's guide.